Handle: Kraftform Comfort with non-roll feature, multi-component. The multi-component Kraftform handle for quick and low-exertion working. The hexagonal non-roll feature prevents any annoying rolling away. The bit material used for manufacturing is subjected to a specific Wera hardening process, and this ensures longer product service life. The Wera Black Point tip and a refined hardening process ensure long service life of the tip. 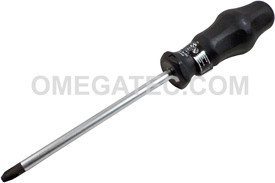 The 05031219001 Wera Kraftform Classic 1735 Slotted Screwdriver is one of thousands of quality tooling products available from MRO Tools. Please browse Wera Kraftform Classic Screwdrivers for tools similar to the 05031219001 Wera Kraftform Classic 1735 Slotted Screwdriver. 05031219001 Wera Kraftform Classic 1735 Slotted Screwdriver description summary: Wera Kraftform Classic 1750 PH Phillips Screwdriver. Point Size: #0 Shank Overall Length: 60mm / 2 3/8'' Handle Overall Length: 81mm Shank Diameter: 3.0mm Quantity discounts may be available for the 05031219001 Wera Kraftform Classic 1735 Slotted Screwdriver. Please contact MRO Tools for details.